I’ve been having a few days off cycling to let my knee recover a bit, before seeing the Physio tomorrow to see what the verdict is. Reckon it should be fine, touch wood. This hasn’t however curtailed planning and shopping activities. 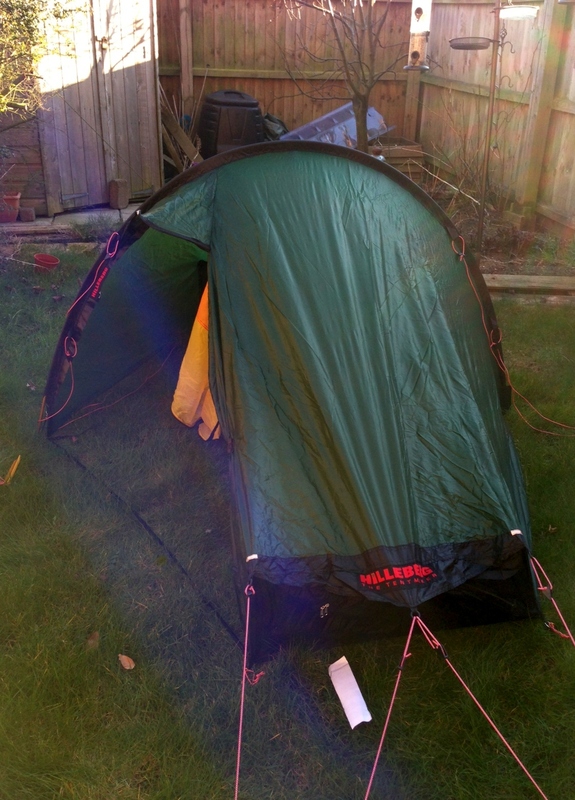 I had a few practice runs in putting up my new tent – Hilleburg Akto. Really easy to erect, with one pole, and should keep me dry given it’s bound to be wet and stormy at certain times during the tour. Well I hope it’ll be stormy sometimes anyway, it’s great being in a tent with the rain pouring down, as long as you don’t get flooded. Actually who am I kidding, this is Britain we’re talking about, they’ll be a hose pipe ban announced next week and then it’ll rain solidly for three months. Think I’ll take my passport just in case I need to change route to the South of France. There are a lot better pictures of this tent on the web, and I know I haven’t done the guy ropes properly. It’s quite spacious though, with room in the porch to put my panniers, and very light at 1.7 kg. Will soon put up the plan for first week or two of the tour, just got to finalise a few more details. Although this really will be subject to change depending on how distracted I get en-route (pubs, crazy golf, festivals, castles etc). This entry was posted in Bike around Britain 2013, cycle tour kit, General on April 8, 2013 by SelfPropelled. Hilleberg seem to be fabulous tents, we have a two man base camp – Tarra – and I’ve always eyed up the model you have in place of our lightweight touring tent because the Hilleberg is lighter. Ours stood up to being pitched on lava ash (like sand but even less cohesive) in a strong wind in Iceland, great bit of kit. Best of luck with the knee healing. Looking forward to following you when you get on the move. We are on a tour ourselved next week around mid-Wales. Something gentle though as Mrs W is 16 weeks with child. Camping on lava ash sounds like it might make a comfortable bed, if a little bit of an inhospitable environment. Iceland is always somewhere I thought would be fascinating to visit. Have a great tour next week and good luck Mrs W!